"“Perfect service and nice people”"
I'm in an Erasmus here in Ljubljana and Atet rent a car always help us to go in the trips. 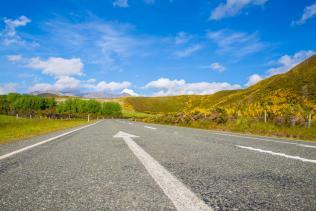 Renting a car is easy and fast, they have a lot of options and they always help you to take the perfect car. The people there are so nice and put all the facilities for our trips. If you are in Eslovenia, don't doubt to rent the..
Ljubljana is a great start base from which you can visit the rest of Slovenia. You can rent a car in Ljubljana and travel to different part of Slovenia each day. 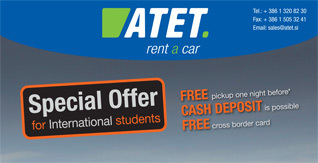 Special offer for all Erasmus and International students. The best deal anywhere. All new vehicles - check our range of cars and pick your own! 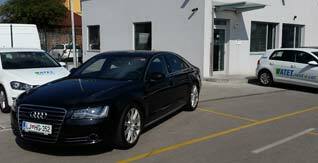 Best rental service in Slovenia. "ATET is an excellent company!" Travel to an exclusive event with a car, worthy of a special occasion. We proudly accepted the Excellent SME certifikate for 2017. We are ever more commited to providing the best possible service for our customers.